Bucerías, the Riviera Nayarit’s Wind Capital, will be hosting the most important stop on the National Tour of the Mexican Kitesurf Association from May 16-18. Bucerías, the Riviera Nayarit’s Wind Capital, is hosting the Wind Festival for the fifth year in a row. This international kitesurf competition is considered the most important stop on this leg of the National Tour held by the Mexican Kitesurf Association (AMK by its acronym in Spanish). The weekend of May 16-18 will be one of intense activity in the waters off of Bucerías’ shores. The event will bring in approximately 200 participants, about 30 more than last year. 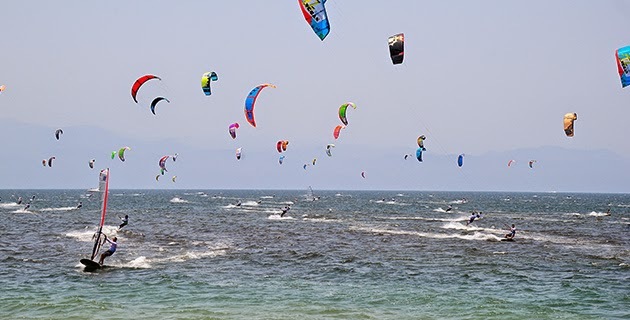 Agustín Tapia, Secretary of the AMK and one of the presidents of the Wind Festival organization, stated there are very few places to practice kitesurf in Mexico and the Riviera Nayarit has the best conditions to do so. “We have a 90 percent chance of winds during the month of May, making this one of the best spots in the country and in all of Latin America,” he commented. He also mentioned several factors including the climate and the hotel infrastructure, both of which are very favorable in welcoming the many guests that will be coming in from the Yucatan, Quintana Roo, Sinaloa, Jalisco, Colima, the Federal District, Veracruz and Nayarit, domestically. Internationally they will see participants from the United States, Canada, Italy, France, Spain and Switzerland. The competitions include Down Wing, a race for all categories; Big Air, where the prize goes to the highest leap; Freestyle for tricks and showy moves (this is divided among Pro, Amateur and Women’s categories); and Course Racing, which consists of a Long Distance portion and Slalom. The categories include athletes that range from 10 to over 40 years in age with, of course, separate men’s and women’s categories. The festival, hosted by Bucerías, also shares some of its activities with La Cruz de Huanacaxtle. The Riviera Nayarit Convention and Visitors Bureau invites the public at large and any tourists whose stay coincides with the Wind Festival to be a part of this event and share in helping make it grow. For more information click here: http://festivaldelviento.mx/.